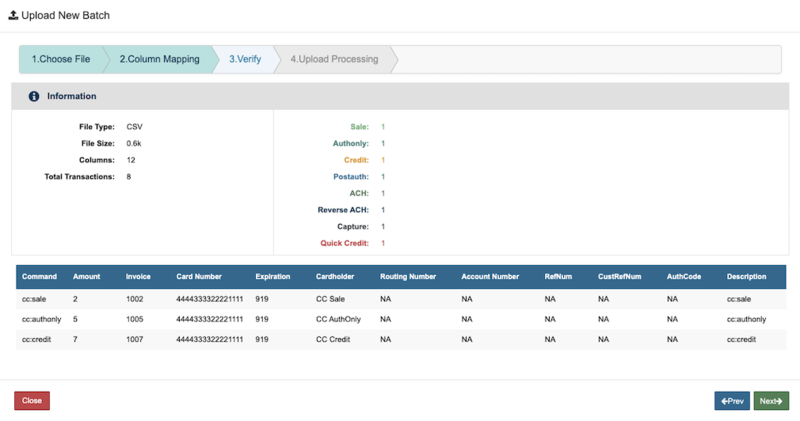 The Upload Manager allows you to upload a batch of transactions and displays all of your previously uploaded credit card and check transactions. View the uploaded transaction and the remaining transactions to be uploaded from the batch. Check the amount of Approved, Declined, and Errors from the uploaded batch. Select any of the batches to view, view the upload status, review, email, import to your billing database, block a card, do a quick sale, and issue a quick refund for each transaction. To view your uploaded or uploading batches, click 'Select Date'. You can view all your Pending Batches, Running Batches, Paused Batches, Completed Batches, a batch from a specific date, and batches from a specific date range. These files includes basic information for uploading Credit Card and ACH transactions. The file your uploading must be in .csv format. The fields below give a description of the fields outlined in the sample files above as well other accepted fields. The "Required" column denotes if the field is required for ACH transactions, Credit Card(CC) transactions, or Both. If the "Required" column is blank then the field is not required for batch uploads. Command Both Possible values are: sale- credit card sale , credit- credit card refund , check- ACH sale , or reverseach- ACH refund. If left blank, this defaults to sale. Invoice Both Unique Invoice or order number. Up to 25 digits. Cardholder Both Cardholder or account holder name. Amount Both Total amount after tax has been added. Tax Amount of the total that is tax. This is for reference only and will not be added to the amount. Description Brief description of goods or services purchased in transaction. Comments Optional transaction comments field. Comments are displayed on the transaction details page. PO Number Purchase Order number. Only required for corporate purchasing cards. Customer ID An ID that the merchant assigns to each customer. Can contain letters and numbers. CustRefNum A unique customer number assigned by the gateway. If you are updating customer information, this is required. Card Number CC Customer's card number. Expiration CC The expiration date for the card. Accepted formats include: MMYY, MMYYYY, MM/YY, MM/YYYY. AVS Street The billing street for the card. If you have implemented the AVS Response Fraud Module, this is the address we verify with the bank. Click here for AVS response codes. AVS Zip The billing zip for the card. If you have implemented the AVS Response Fraud Module, this is the zip code we verify with the bank. Click here for AVS response codes. CVC/CVV2 3 or 4 digit codes printed or embossed on Visa, Mastercard, American Express and Discover cards. If you have implemented the Card ID Checker Fraud Module this is the number we verify with the bank. Click here for CVC/CVV2 response codes. Check Number If given a physical check, this is the check number the bank provides. Routing Number ACH Customer's routing number (9 digits). Account Number ACH Customer's bank account number. Drivers License # Drivers license number used to verify customer's identity. Drivers License State The state that issued the above drivers license (also for identification purposes). Format The check format. Click here for more information on check formats. Billing Company The customer's billing company name (not required if a First AND Last Name are included). Billing First Name Customer's billing first name. Billing Last Name Customer's billing last name (not required if Company is included). Billing Street Customer's billing street address. Billing Street 2 Second line for customer's billing address. Can contain Apt or Suite number. Billing City Customer's billing city. Billing State Customer's billing state. Billing Zip Customer's billing zip. Billing Country Customer's billing country. Billing Phone Customer's billing phone number. Shipping Company The customer's shipping company name. Shipping First Name Customer's shipping first name (not required if Company is included). Shipping Last Name Customer's shipping last name (not required if Company is included). Shipping Street Customer's shipping street address. Shipping Street2 Second line for customer's shipping address. Can contain Apt or Suite number. Shipping City Customer's shipping city. Shipping State Customer's shipping state. Shipping Zip Customer's shipping zip. Shipping Country Customer's shipping country. Shipping Phone Customer's shipping phone number. 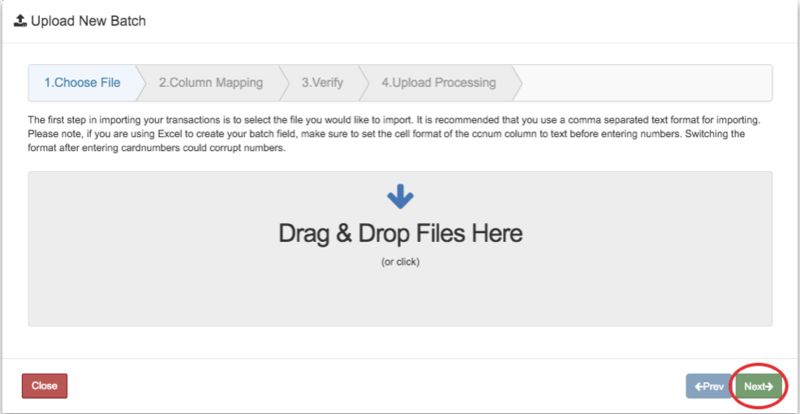 From the Upload Manager homepage, click 'Upload Batch' located on the top right hand side of the page. Select the file to import or drag and drop the file(s) into the drag & drop window. It is recommended that you use a Comma Separated Text format for importing. Please Note: If you are using Excel to create your batch field, make sure to set the cell format of the Card Number column to text before entering numbers. Switching the format after entering card numbers could corrupt the numbers. Click 'Next' to continue to the next step. Click on the 'Select Field' drop down to match fields for each column. Select the field descriptor that best describes the data in that column. Click 'Next' to continue to the next step and click 'Prev' to return to previous step. Verify the columns are tapped to the correct field. Your batch upload will process once you click 'Next' . The pop up page will display if your batch is uploaded successfully, showing the number of imported transactions, skipped transactions, and remaining transactions. Click 'Close' to be directed to the Upload Manager homepage.